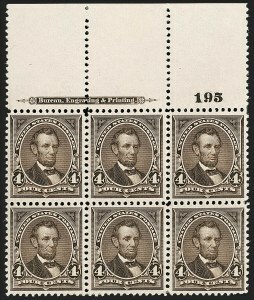 We have offered only one Mint N.H. top position plate block since keeping computerized records, with selvage significantly narrower than the example offered here. Another top position is contained in an intact pane of 100. We have offered only two other wide top plate blocks since keeping computerized records. Both are hinged and have similar centering. We have offered only two other top position plate blocks since keeping computerized records. Both were offered in our 2009 "Whitpain" auction. Fogelson had one with narrower selvage, and W. Parsons Todd had one with similar selvage. Based on centering and selvage size, the example offered here is the finest we have encountered. We have offered only two from the top position since keeping computerized records. Only one of those had wide selvage comparable to the example offered here. 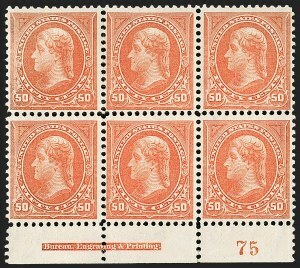 The "USIR" (United States Internal Revenue) watermark error occurred when a supply of paper reserved for revenue stamp production was used for printing the 6¢ and 8¢ postage stamps. The 6¢ "USIR" Watermark error is considerably rarer than the 8¢, especially in original-gum condition. We record less than ten original-gum copies, and only one other in a multiple, which is a pair with straight edge at left containing one example of the error. 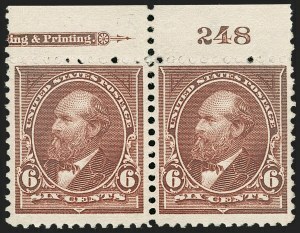 The "USIR" (United States Internal Revenue) watermark error occurred when a supply of paper reserved for revenue stamp production was used for printing the 6¢ and 8¢ postage stamps. Our records contain four wide top imprint and plate number strips of three available to collectors, plus one with narrow selvage from the bottom position. 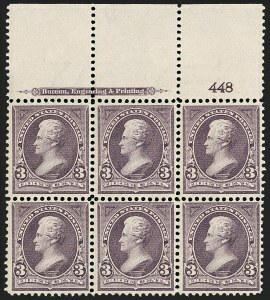 The unique plate block of six is contained in the Miller collection owned by The New York Public Library. 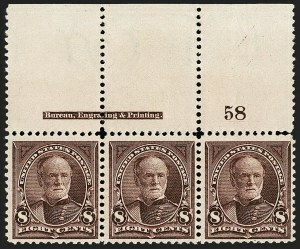 This is an extremely rare plate block in Mint N.H. condition. Our computerized records contain only one other, from the left position (perfs touch design). A review of name sales also failed to find another. If we expand the criteria to include hinged plate blocks, there are perhaps three or four others, all with narrower selvage. 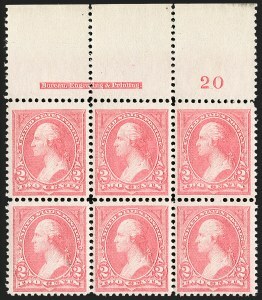 This is a rare opportunity to acquire a matched set of top imprint and plate number strips of this issue. 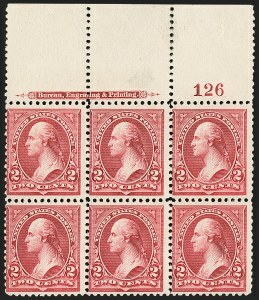 Since keeping computerized records, we have offered only one $1.00 1895 Type I-II combination plate block (1967 Rarities of the World) and three top imprint and plate number strips. 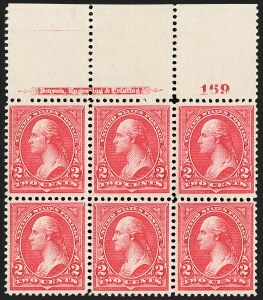 Only five $2.00 1895 plate blocks are recorded (Scott value $85,000.00), and only one $5.00 1895 plate block is known (Scott value $200,000.00). 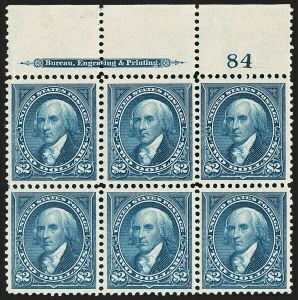 The matched set offered in this sale is a perfect way to show the First Bureau Issue dollar values with imprints and plate numbers. 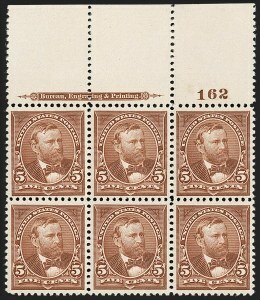 This set was featured on the cover of our Sale 829 when it was offered on behalf of Raymond Fox. 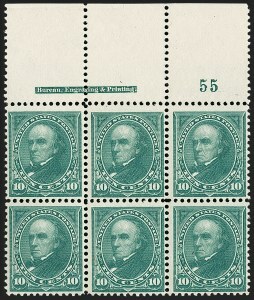 The $2.00 regular issue designed by the Bureau of Engraving and Printing in 1894 was the first stamp to depict this Founding Father and the nation's fourth president, James Madison, whose diminutive stature earned him the unflattering nickname "Little Jemmy." 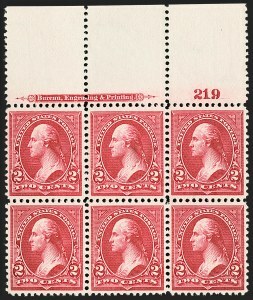 This was also the first $2.00 regular issue (preceded by the Columbian $2.00 stamp). 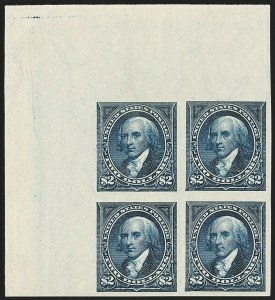 5) Full top plate block of 6, selvage partly separated and rejoined, October 1974 Siegel sale and more recently in the 2008 "Newport" sale (Weiss).